One of our favorite places to go when we’re seeking out a bit of creativity on our plates, without the “show” that usually goes along with those kinds of places. There is no pretense at Oinothira, just lovingly prepared, fresh food at this hidden away gem behind the church across from the Square in Kaisarianni called Oinothira (Makariou 13 at Chris. Smirnis Sts. 210/72.58.428. Call if you are visiting in August, they generally close at some point during the month, although now with tables kaddy corner for additional outside dining, they may remain open more weeks in August). 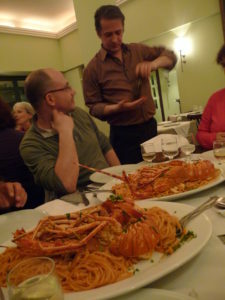 This understated little NON SMOKING restaurant serves wonderful Greek creations like a seasonal seafood and artichoke salad, various seafood pastas as well as an awesome seasonal “astako macaronada” (spaghetti with lobster). 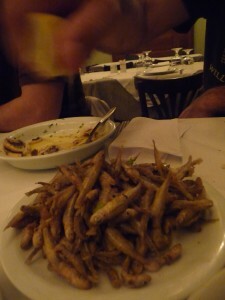 But the real surprise were the stuffed sardines. I’m not a fan of sardines in general, but I figure that any chef who takes the time to actually stuff these tiny fish deserves my respect enough for me to try them, and I was certainly glad I did. While it hasn’t made me a fan of unstuffed sardines, I liked them enough to be disappointed when I visited again and they weren’t on the menu (sardines are sensitive to the full moon, and since they’re fished at night, a full moon causes them to dive deep beyond the reach of the fishermen). You’ve got to love a chef who has the patience to stuff these little guys!So refreshing to find interesting, creative dishes without all the pretense. 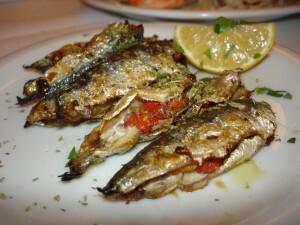 And those looking for more traditional Greek dishes will be pleased with the pop in your mouth freshness of these tiny fish.Oinothyra offers a nice selection of traditional and not so traditional sides and starters, make them into a meal to share.